The most common variety of crab eaten in the UK is the brown crab, which tend to be in season from April until November. Crabs are something of a two-in-one ingredient for chefs, as they contain both light, sweet white meat and the richer brown meat - fantastic used both as a mix and on their own for their own unique flavour qualities. 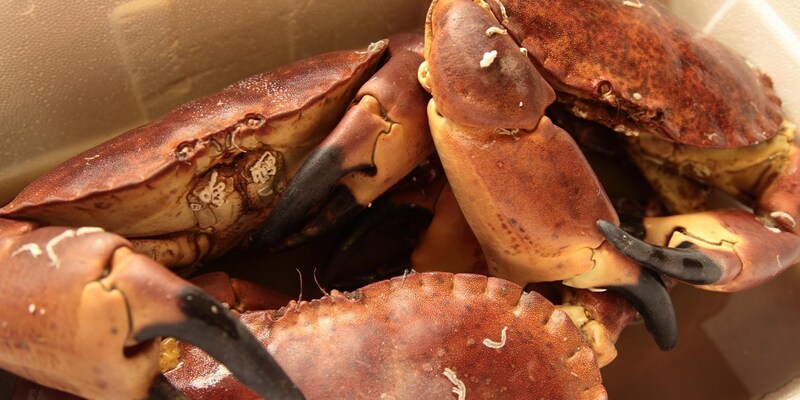 If buying a whole crab yourself take a look at our how to cook crab guide for advice on preparing the creature - remember, too, to keep the crab's shell, for this can be used to make seafood stocks. This collection of crab recipes contains some fantastic inspiration, whatever your level. Martin Wishart’s quick Crab fishcakes and Theo Randall’s healthy Crab salad recipe are both simple to prepare, while Paul Ainsworth’s Crab linguine is a fantastic easy seafood pasta recipe. For something a little more challenging, give Richard Davies’ vibrant Crab salad with pineapple a go - the range of textures and colours will be a delightful treat for your guests.